Grammar is a touchy subject if you ask me. No one really likes to be corrected, at least I don’t… and my kids really don’t like it either! Even so, I think it’s worth a little stress to make sure good writing skills are being learned. The following links are more than simple worksheets, which can be found with a quick google search. Let’s get down to business finding some free grammar and writing lessons so our kids will know how to write a proper essay by the time they apply for college. Daily Grammar is a free online program with 440 lessons and 88 quizzes. Links to all of these grammar lessons and quizzes can be found on their archive page. There is also a Daily Grammar blog to which you can subscribe and receive daily grammar lessons. This is a basic course that has no frills. A Guide to Grammar & Writing has useful and detailed lessons and quizzes, as well as a resource for writing a great essay, with the Principles of Composition. It seems that this information could be used beyond high school. There is a handy index where you choose your topic, read about the rules pertaining to it, and follow it up with a quiz when it is provided. The University of Bristol has an extensive grammar page with many interactive lessons and quizzes. I recommend these pages for students who are in middle school and higher. It is geared to the writing of formal academic essays and the type of language expected in such situations. The lessons are online and have interactive quiz questions throughout the lesson to check for understanding. There is a yahoo group for homeschoolers who do NaNoWriMo and they seem very excited to be preparing to do this in November. They also have a very comprehensive workbook that go step-by-step through all of the steps involved in the writing process. If all of that is too advanced and you are still trying to get your kids to become familiar with the names of the parts of speech, look into something from a long time ago: Grammar-land. It is a book in the public domain by M.L. Nesbitt (c1878) that is full of courtroom drama as Judge Grammar calls the parts of speech into court because they are being accused of being used improperly. This story re-introduces the rules of grammar in a dramatic fashion that is likely to keep the attention of most kids. 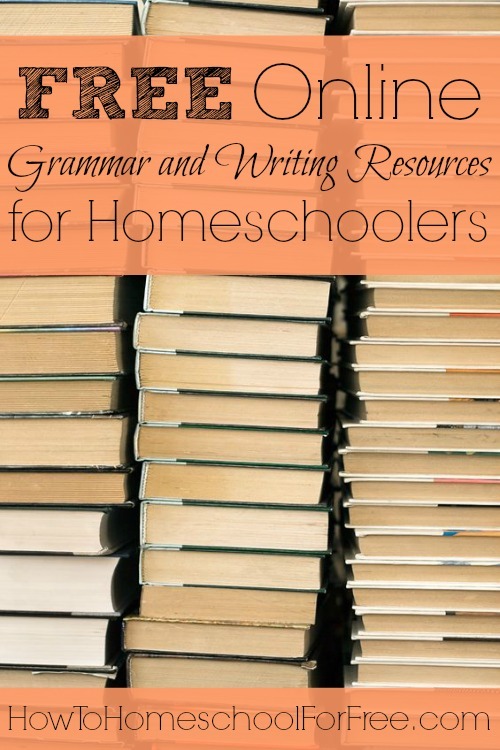 For additional help with Grammar-land lessons, another homeschool mom has made Grammar-land .pdf worksheets for each chapter! And if that’s not enough to get your attention, I found a FREE podcast on itunes that is the audiobook companion! I am definitely going to give this a try. It sounds too fun to ignore. For grades K-6, Scott Foresman has free grammar & writing textbooks for downloading. These are full textbooks for grammar and writing. The table of contents is listed with a link for each unit. You will right click (for most of us, anyway) to select a download option. We used these for 1st grade one year and I found them to be very easy to use. There is not a teacher’s manual, and I didn’t see where to get one. If you find out, please leave a comment about it.